It’s no secret that artists sometimes create their most authentic works in moments of despair. While intentions to repair their own broken hearts can supersede their desire to communicate with the public, the rawness of their experiences often creates a bridge to the hearts and minds of others. It is a circumstance such as this that brought guitarist, singer, and songwriter Rebecca Frazier to her newest work. Frazier achieved notoriety in the bluegrass world as the first woman ever to appear on the cover of Flatpicking Guitar Magazine, and is widely known for her work with award-winning Colorado-based band, Hit & Run. In November 2010, Frazier was faced with a void after the loss of her second son, Charlie. Uncertain of the future, and trying to move forward while continuing to raise her first son, a toddler at the time, she turned her attention to her writing. She’d hoped to revisit her muse once her second son was of school age, but life had different plans. 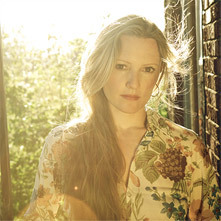 And as life can do, it took another turn during Frazier’s unplanned return to the studio in 2012–the birth of her first daughter, Cora, took place during the recording of her May 28 Compass Records release, When We Fall. When We Fall is something different for Frazier: a collection of self-penned bluegrass and Americana songs, presented in a classic way. “I’m inspired by music from the 1970’s,” she says. “early Bonnie Raitt; old-school Tony Rice and Dave Grisman Quintet; Neil Young: this music feels like home to me,” she says. And but for the one Neil Young cover, Frazier has divulged a lot of herself with her ten original songs, while still showcasing the shredding guitar skills she’s known for. 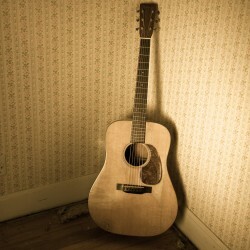 In songs like “Love Go Away From This House” and “Darken Your Doorway,” she offers painful perspectives from failed love, and, as she puts it, “all the bad that comes with the good.” Yet there are hopeful notes about long-term romance in “Walk This Road” and “Morning & Night.” There’s an old-time feel to “Better Than Staying,” in which each character’s restlessness to keep moving culminates in the calm peace of a dying mother. 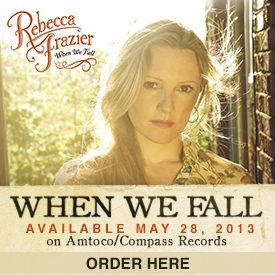 The song, “When We Fall,” Rebecca says, “asks a question about losing our innocence. Can we fall down and lose self-respect, but get back up and look ourselves in the eye?” The album ends with “Babe In Arms,” a lilting string-band lullaby for her son. The album places Frazier right in line behind the bluegrass women that preceded her—the driving track “Ain’t Gonna Work Tomorrow” is reminiscent of early recordings of Alison Krauss, while instrumentals such as “Virginia Coastline” and “Clifftop” give a tip of the hat to guitar legends Tony Rice and the late jazz guitarist Emily Remler, about whom Frazier wrote her Honors Senior Thesis at the University of Michigan. Accompanying Rebecca are a host of world-class acoustic artists: her husband and musical partner John Frazier on mandolin & vocals (Steve Martin, Jim Lauderdale, John Cowan), bassist Barry Bales (Alison Krauss), banjo genre-bender Scott Vestal (Sam Bush), Dobro genius Andy Hall (Infamous Stringdusters), fiddle virtuoso Shad Cobb (John Cowan), banjo innovator Ron Block (Alison Krauss), and, on backing vocals, her longtime Western compatriot, Shelby Means (Della Mae). The group was launched as a successful touring act out of Colorado, gracing stages of prestigious festivals and venues in 42 states and Canada, and eventually migrating to Nashville in 2007 with two studio albums under their belts. Once there, the group’s mandolinist (and Rebecca’s husband), John Frazier, was offered a position with John Cowan Band. The timing was right. “I was daydreaming about starting a family,” says Rebecca. “I knew I couldn’t make the leap into motherhood while living on the interstate and at festivals.” Her first child was born. Hit & Run continued to tour, albeit not full-time. Rebecca continued her studio work (she’s a featured performer on Curb Records’ 2012 release, The Last Ride, the soundtrack for the 20th Century Fox movie, and she and John produced three records for CMH Records’ Pickin’ On series); she used her spare time to write. While the album showcases Rebecca’s longstanding passion for guitar with several barn-burning originals, listeners will also hear the pure, pining—and at times exposed—soprano tones of a woman who has matured through seasons of heartbreak, loss, and love. It’s unusual for a touring musician to move to Nashville with the intention of having children soon after, but motherhood has seasoned and enhanced Frazier’s music. 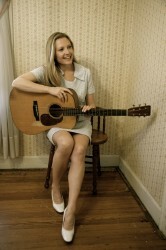 Rebecca Frazier gained notoriety as the first woman on the cover of Flatpicking Guitar Magazine, and has since become known as “a genuine triple threat as singer, songwriter, and flatpicking guitarist.” (Nashville Scene) In 2017, Paste Magazine included Frazier in their piece titled “7 Women Smashing the Bluegrass Glass Ceiling.” Frazier was the first woman to be nominated for Guitar Player of the Year by the Society for the Preservation of Bluegrass Music of America (SPBGMA) in 2018, and was nominated again in 2019. Frazier is widely known for her work with award-winning Colorado-base bluegrass outfit, Hit & Run. The only band to win all three Rockygrass, Telluride, and SPBGMA Festival Band competitions, this successful touring act has graced stages of prestigious festivals and venues in 42 states and Canada, and eventually migrated to Nashville in 2007 with two studio albums under their belts. Producers, John & Rebecca Frazier. >> New ‘When We Fall’ Video TODAY! >> New Video June 20! >> “Everyone Loves Guitar” podcast out today! >> ‘Darken Your Doorway’ Video Today! >> Tune in to Heartland TV this month!